Earlier this week, Echo Nest’s Paul Lamere posted a chart of each state’s favorite “distinctive” artist, whether it hailed from there or not. Or rather, the rhetoric behind that chart was such that a lot of people—including us—were led to believe that the chart displayed each state’s favorite band. But ever the manipulator of data and dispeller of false information, Lamere has come up with a map of each state’s actual favorite band. The results, not surprisingly, are a lot less interesting. 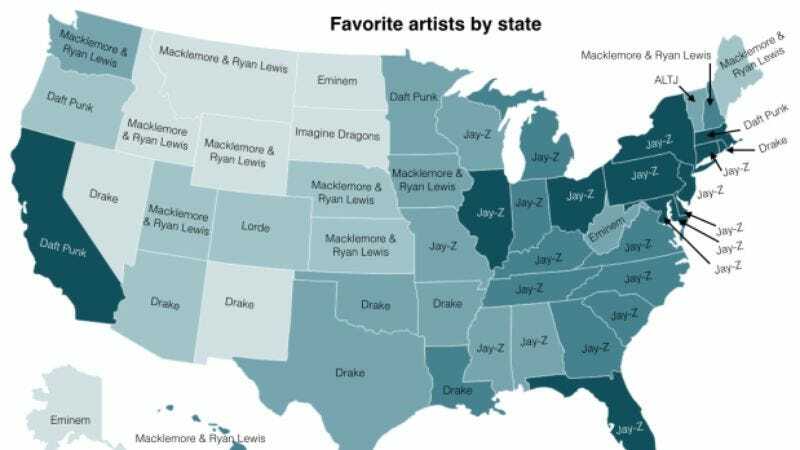 Much of the nation, including wide swaths of the east and Midwest, is absolutely dominated by Jay Z; Oregon, which formerly went for Kurt Vile, now sits firmly in the Daft Punk camp; and a good portion of the west and Pacific Northwest is on Team Macklemore. At least Vermont still likes Alt J.